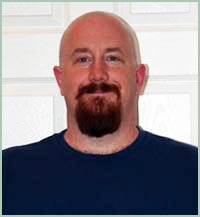 Eric Deke is a rural mail carrier from Buckner, Missouri. 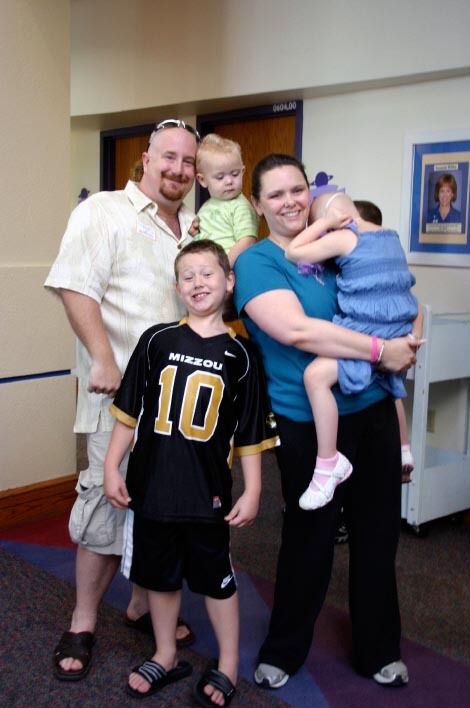 His request of $25,000 is to provide new toys, movies, video games, board games, washable laptops, and portable Nintendo Wii Fun Centers for the cancer patients at Children's Mercy Hospital in Kansas City, Missouri where his 4-year-old daughter, Aspen, is a patient. Aspen has ph+all leukemia so Eric has spent a good deal of time at the hospital. Eric tells us that Children's Mercy Hospital is currently treating 1671 HemOnc patients with a yearly average of 150 new children. 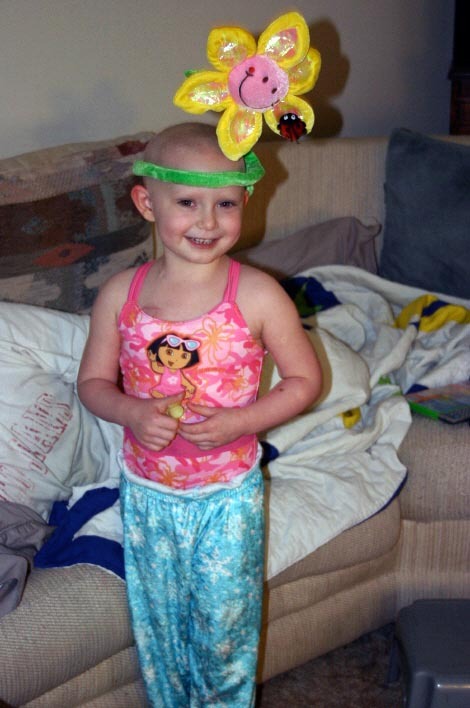 Some patients, like Aspen, have long treatments that may last for years. 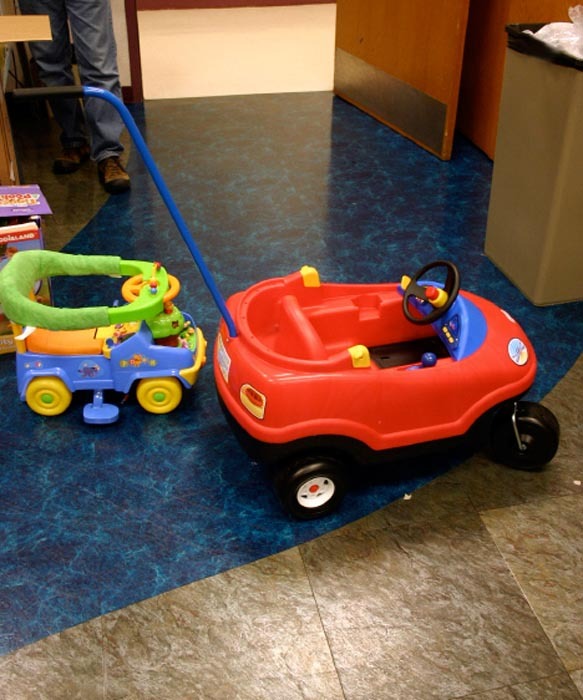 Due to the children’s weakened immune systems, their toys need to be kept very clean and germ free. 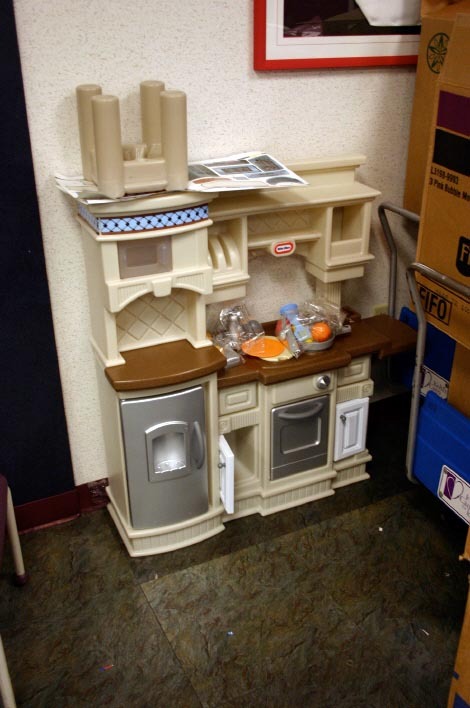 The toys and games in use now are missing some parts and are harder to keep clean. Eric would like to donate all of the old games and toys to needy families and replace them with new ones, as well as refurbish their pinball machine. His long list of toys and games also includes Toughbook Laptops, which can be washed and sanitized. Just last week I visited Childrens Hospital Los Angeles with Jackie when she presented them with her own truckload of gifts. 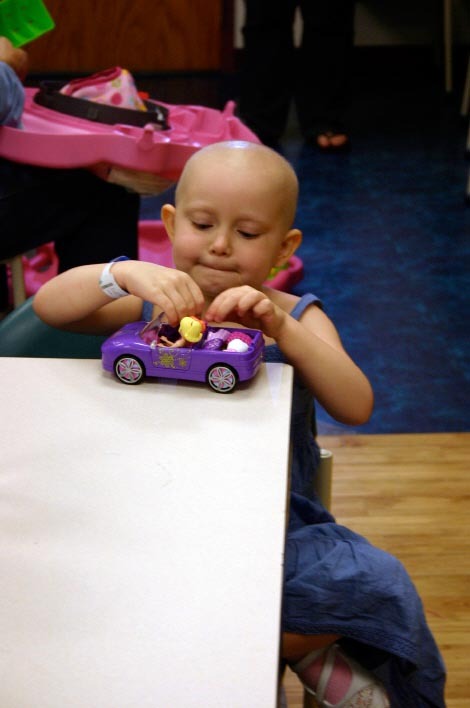 Seeing the patients at a children’s hospital is not something you soon forget. That’s why I chose Eric today. I just wanted to do more. Amanda wrote to me over the holidays about how much she and Eric enjoy watching all the kids play video games on the Wii's in clinic and on the cancer floor. "We hear stories each time Aspen has to be admitted about the kids that GET OUT OF BED to bowl or play tennis, she wrote. "The kids in the bone marrow transplant unit can't leave their rooms most of the time, so these video game systems have been such a Huge benefit for them. They have something more to do than lay around watching movies, reading the same books or watching TV. I'm sure they have other things to occupy themselves, but these have been a big morale booster. The toys in the playroom have been great too. One of the things I picked out was a set of metal pots and pans for both the clinic and they hem/onc floor. When I picked these out I was thinking about how much easier these would be to sanitize and they wouldn't get scratched up so they would last longer. What I didn't think about was the noise factor. Duh. What do you think the first thing little kids do when they pick up METAL pots and pans??? Yep. They bang the heck out of them. I'm not sure the Childlife Specialists are so thrilled with my choice. Just kidding. They love everything!!!" I live in Kansas City, Kansas with my husband and five grandchildren. 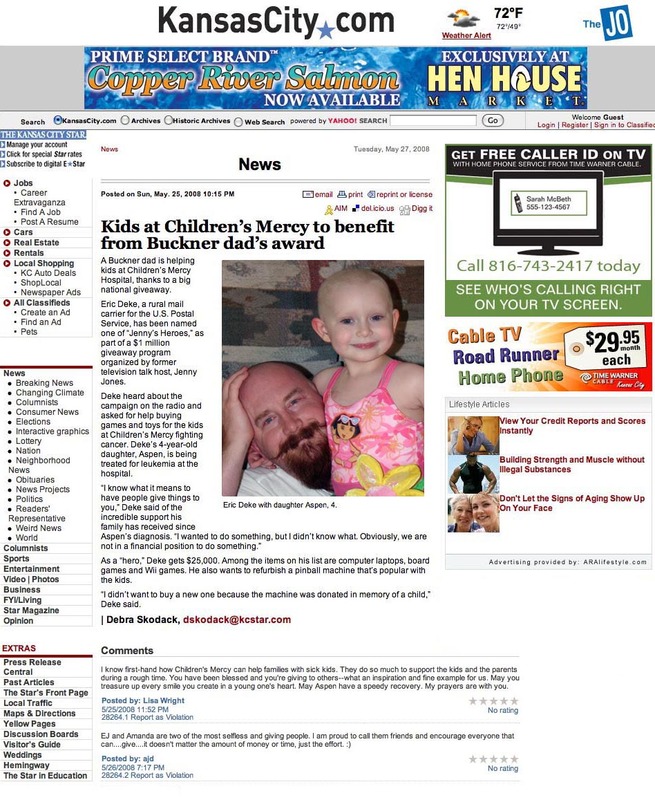 I just read about Eric Deke from Buckner using the grant to buy toys and much more for the cancer kids at Childrens Mercy Hospital..I wondered where all the new great things came from.. Now I know who to say thank you to. I have two granddaughters who have cancer and we are at Childrens a lot. One of my girls, aged 12, was diagnosed in August 2007 with Ewings Sarcoma on her lower pelvic bone, she has one treatment left and hopefully the cancer will be gone and stay away!!!! 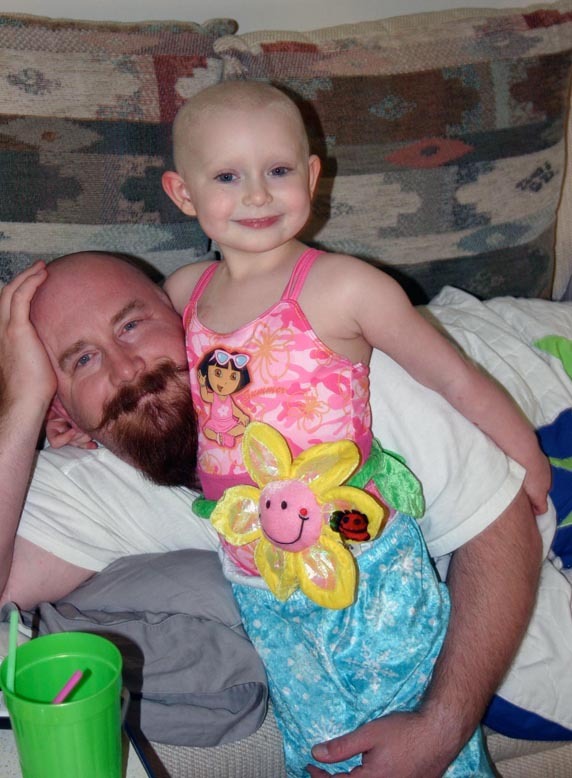 The other girl is almost four, she was diagnosed with Neuroblastoma in January of 2008...such a terrible shock to our family to have two children with cancer...we were devastated to say the least. Our visits and stays to Childrens have been many but the girls haven't seemed to mind because of the great staff and the many activities for them. I just wanted to thank you for this wonderful thing you've done. It's so great for so many kids. When this nightmare of the cancer is over for my granddaughters I hope there is some way I can give back to the many people who have been so supportive of my family during this difficult time. So Jenny, thank you so much. "Wow. Who knew that spending this much money would be this hard? We shopped until I wanted to take a nap in the home entertainment department at Best Buy in one of the display recliners. It was so comfortable after being on our feet for seven hours spending money. Speaking of Best Buy, they have been fantastic. Most of the money was spent at Best Buy and I couldn't be more happy. Not only did they have wonderful customer service but they have continually gone above and beyond my highest expectations in every aspect. From ringing up the full cart load of movies, plus part of another cart, three times and being polite the entire time, to special ordering 60 Wii point cards for us when that was the entire stock of all the Kansas City stores combined. They all chipped in so we wouldn't have to wait so long for them to come in. We ended up having probably close to 350 to 400 movies. I lost count after the first couple of rows. Can you imagine ringing up that many movies three times? Wal-Mart in Oak Grove was awsome too. I don't think I have ever gotten service that good at any Wal-Mart. With Eric bringing Amanda, from CM, and me emptying carts as we filled them up, the employees were making sure that they had everything out on the shelves and they put anything together for us they could. We got almost all the puzzles that were on the list from them along with baby dolls, barbies, Littlest Pets animals and accessories, a Little Tykes Basketball hoop for the clinic (which I really wanted to get because there aren't a lot of toys for the boys), action figures for the boys, and baby doll bottles, clothes and a car seat. Bumbo seats for the babies was a big item we needed to get and found those. Amanda from CM filled a whole cart with art supplies, markers, crayons, pencils, paper, glue sticks and anything else she could think of. That's a lot of art supplies! It's a good thing they had started stocking up for back to school shopping. There is one thing that I should probably explain. When picking out toys for a Cancer floor you have to put a lot of thought into everything you purchase. Everything has to be able to be disinfected by wiping it down. No cloth or fur. We can't even have the rubbery grip on baby doll stroller handles. The only exception I have seen is the hair on barbies, but you can use a disinfecting wipe on it. If you really think about how much cloth is on childrens toys you will see how this can cause issues when picking out stuff. Toys R Us was a blessing because they have such a wide variety. We wouldn't have been able to find half of the things we did if it weren't for them. We also have a rule that says that there can't be any toys with weapons or violent implecations. That means no Star Wars, Pirates of the Carribean, GI Joe, or Transformers action figures. We got two ride-in cars for toddlers and babies to cruise around in while mom or dad pushes, enough plastic food and kitchen accessories to feed an action figure army, wheel barrows for the boys to push around, infant toys that light up and make sounds, bumble animals that bounce around when you shake them up, 3 Spider Man toy computers and 3 Barbie Computers, baby strollers and non-violent action figures. There are so many things that I can't remember them all. There is one more thing that I didn't mention and that's laundry detergent and fabric softener. We have a parent room on our floor for moms and dads to escape to whenever they have a chance or feel like they can. We can watch a little tv on a real couch, heat up food in the microwave, check the cabinets for food that has been donated by local churches for us, use the computer and DO LAUNDRY. 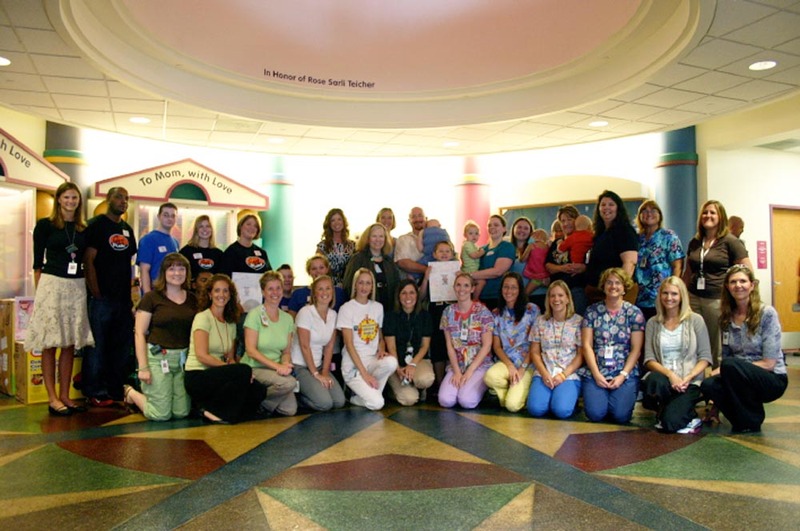 There are a lot of kids that are admitted for weeks to months at a time. This gives those parents that live far away a place to wash their kids clothes without having to leave them alone for long periods of time. All the laundry detergent in this room is donated. The hospital does not provide this because they just don't have the budget for it. I can't tell you what this has meant to Eric and me. This is the gift we wanted to be able to do ourselves and couldn't. So many people have helped us that we wanted to give something back and you gave us that oppurtunity. So again, thank you from the bottom of my heart. We couldn't have done any of this without you." The massive number of gifts was delivered by truck and then everything was unpacked and sanitized by volunteers. 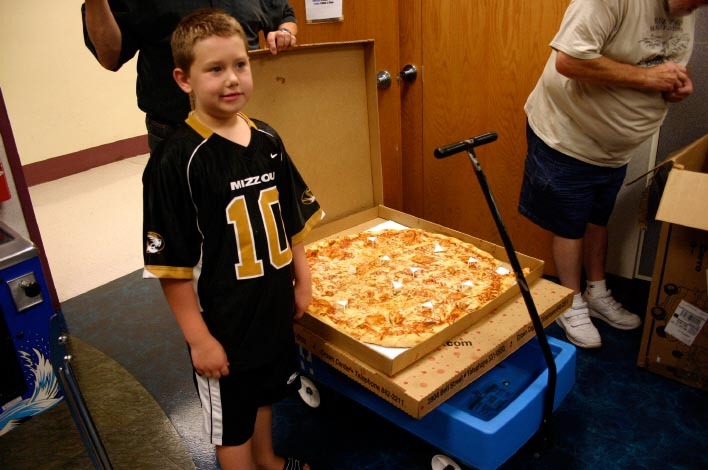 It was an all day event so everyone was treated to giant 3-foot wide pizzas that feed 50 people each! But things didn’t go quite the way they planned. 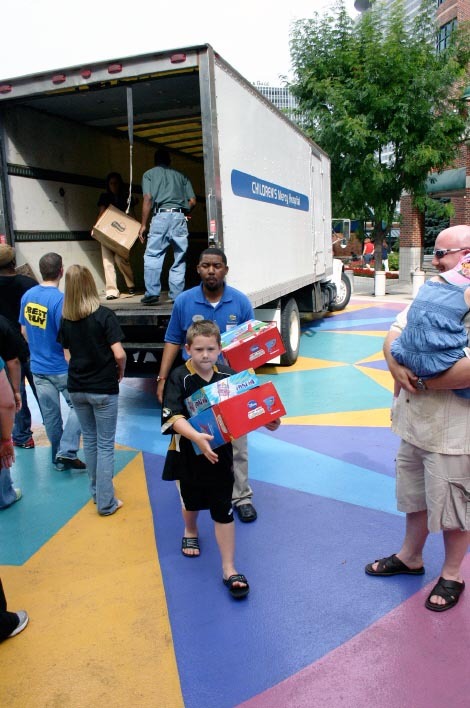 The truck came late while everyone waited in 101-degree heat but once it arrived, all the volunteers got to work. 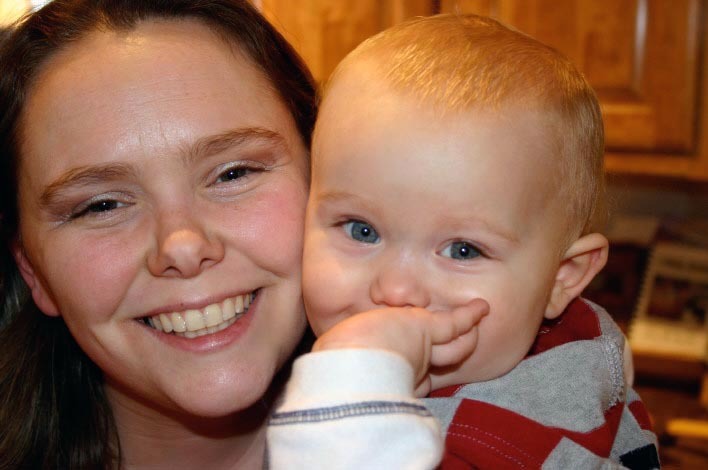 I called to talk to Amanda Woelk with Child Life Services and Amanda picked up the phone. We chatted about how things were going and I asked if she received the plaque we sent for Eric. She seemed a bit unsure and then said she was distracted because she had a child with her. I said, “Oh, how old is the child?” She said, “Aspen is 5 years old.” What!? I then realized I was talking to Amanda Deke! It was the wrong Amanda! How funny is that? And the plaque was supposed to be a surprise so she said she would not tell her husband. Then I spoke to the right Amanda and thanked her for helping set up a spectacular delivery for Eric. After that, Aspen’s oncologist, Dr. Michelle Manalang, came on the phone and thanked me on behalf of all the doctors there. She was very gracious and told me what a huge impact Eric’s gifts would have on their young patients. She said the new games would help the children pass the time and also help with their depression. What impressed her the most was how Eric, while dealing with his own daughter’s issues, was still able to think of the other families and chose to help so many others. Another special attendee was Aspen’s pediatrician, Dr. McEntire and his nurse, Kelly Jo Gorman. And we can’t say enough good things about the people at Best Buy. They sent 12 volunteers who followed the hospital I.T. technicians as they installed each Wii, and the Best Buy staff programmed them immediately. The kids on the floor were very excited about the Wii’s and this way they won’t have to wait to use them. Picture a receipt that's 14 feet long! That's how long the receipts are end-to-end for the toys and games that Eric recently purchased. 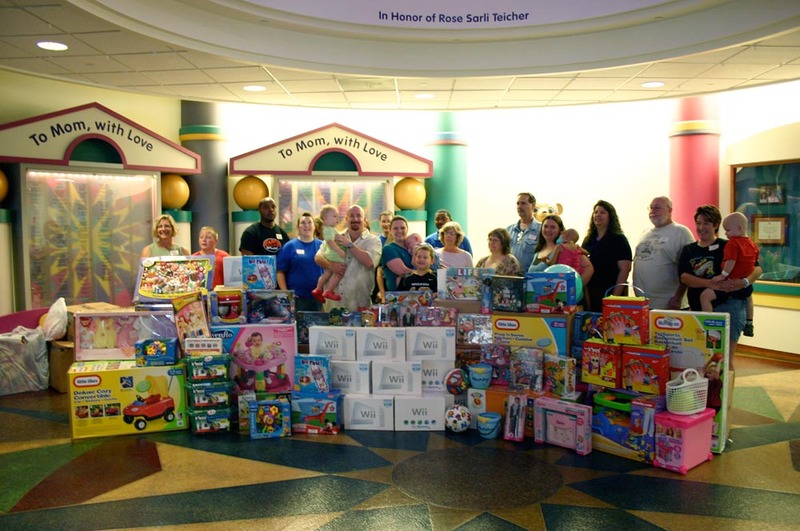 Besides the 35 Nintendo Wii's that he managed to get, Eric just bought 500 toys & games and 500 movies for the hospital. When I saw all the receipts come in I got a ruler and measured 169 inches! He's storing everything in his basement until it goes into a van next week and straight to the hospital. Now that's going to be exciting! He's almost done! Eric purchased the rest of the Nintendo Wiis from Best Buy and he's still waiting to hear about the pinball repair. He's trying to coordinate a shopping day with Childrens Mercy and then they're planning a party on the floor to deliver and open and install everything. 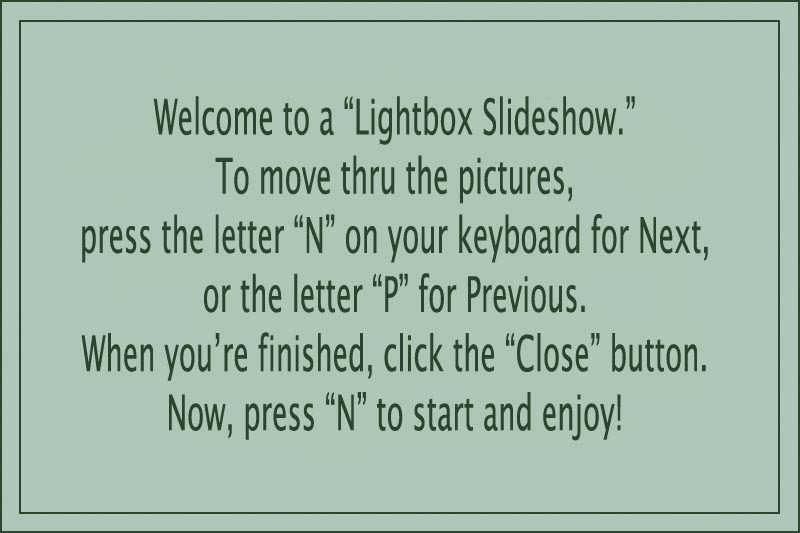 It should be exciting! Things are going great with Eric's shopping. Best Buy will let him have 14 more wii's which is huge because they are hard to come by. Best Buy is also going to donate the time of several employees to help install all of them. "I cant say enough about how great they have been," says Eric. Next, he will buy board games, toys, art supplies, and a camera for the floor for special memories that happen on the floor. He's also buying some laundry detergent for the washing machines on the floor for extended stay parents, then movies and some wii points to download old nintendo games on the wiis. It will be a busy month trying to fit all the shopping in between Aspen's admissions to the hospital, but Eric says it's really been fun. Here's the latest on Eric's shopping: He plans on buying 19 to 21 wii's today along with all of the accessories that go along with them, depending how many Nebraska Furniture Mart has for him. And he finally heard back from the pinball guy and will be getting the cost of repairing it soon. After his first big purchase, Eric will then budget out how much to spend on movies, toys, and games. All the toys that Eric will be replacing will be donated to the local Ronald McDonald House and the What So Ever Community Center which is a shelter for homeless families and they are both very anxious for these donations. 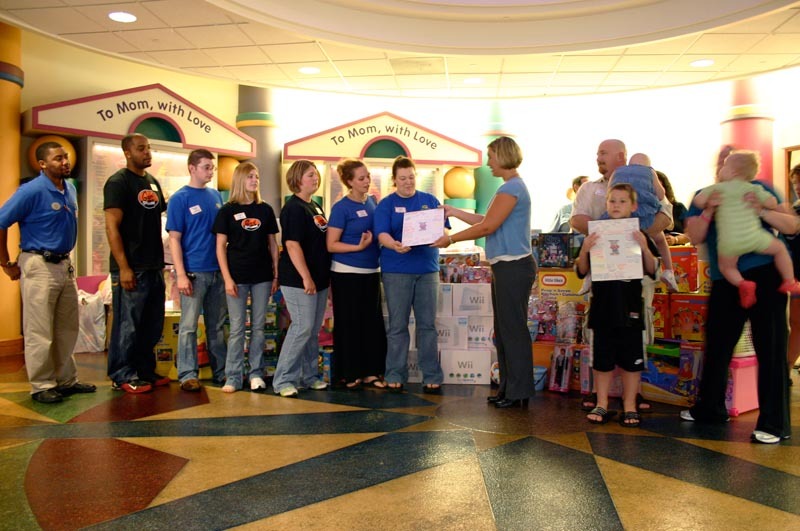 The nintendo wii's will be replacing play station 2's that the hospital currently has, so they will be moving some of those to other floors on the hospital and some of them will also likely be donated. Eric received a really nice "thank you" from the Best Buy Staff in Independence and I posted the note but have to wait for Damon on Monday to post the staff picture they sent. It looks like it won't be much longer for Eric to deliver his gifts! Eric has been busy bargain shopping for his gifts. He's decided to get a Nintendo Wii for every room on the cancer floor - that's 25 rooms! Nebraska furniture mart is holding 6 of them for him and Best Buy thinks they can come up with the rest. "The nintendo Wii is very hard to find and sell out immediately," says Eric, "so this is huge!" He says Best Buy in Independence, Missouri has been super to work with and is even giving him free movies, and that Nebraska Furniture Mart has been really helpful too. I can't wait to see Eric's final shopping list! 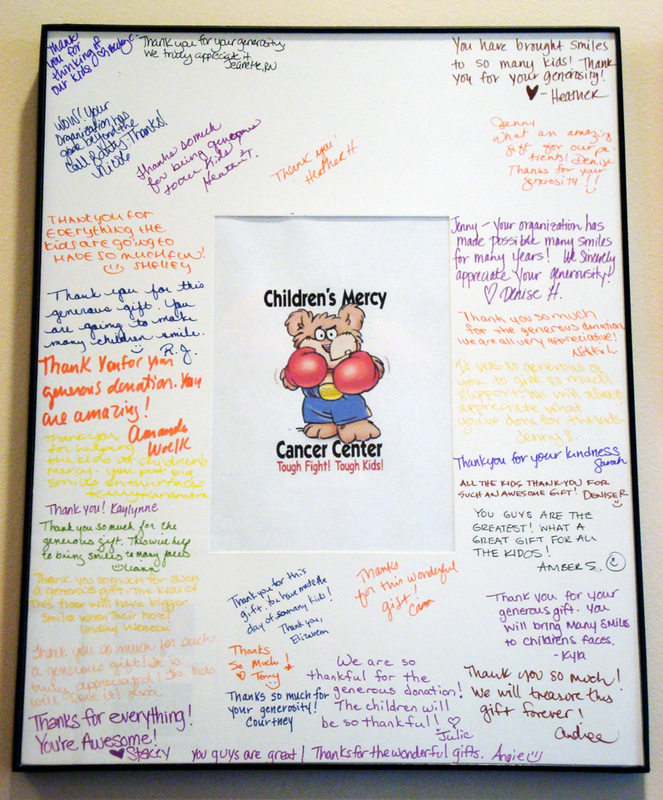 Thank you from the entire Hemotology and Oncology Department at Childrens Mercy Hospital in Kansas City. I can't tell you how excited everyone is. All the parents are super hyped too. I posted Jenny's Heroes site on our daughter's caring bridge page so everyone who visits us can see it too. 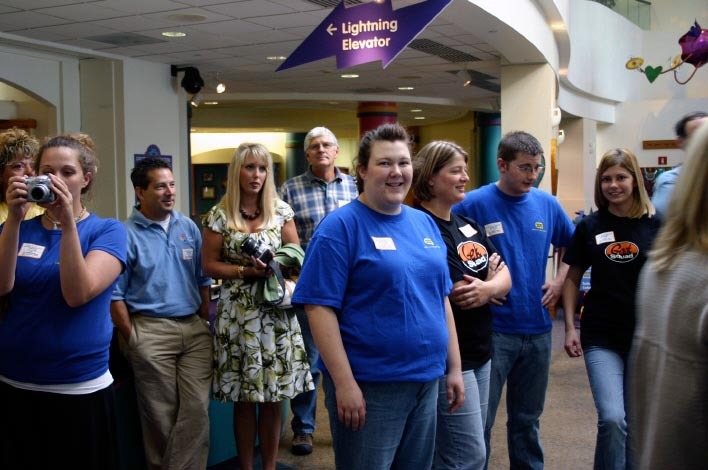 The caring bridge site has been an unbelievable connection to families all over the country and even the world. Its like a big chain and more and more families are linked together because of it. There are kids here at our hospital that I might not have ever met, but because they were on one of our friends sites I have been blessed to become friends with them and their families. Thank you again for everything. I called Eric at the post office in Blue Springs where he works to surprise him with the good news. He told me that Aspen was diagnosed last November and that they go to the hospital every three weeks, staying for 2 to 10 days. Eric and his wife, Amanda, have two sons as well, 7-year-old Alex and 17-month old Evan. 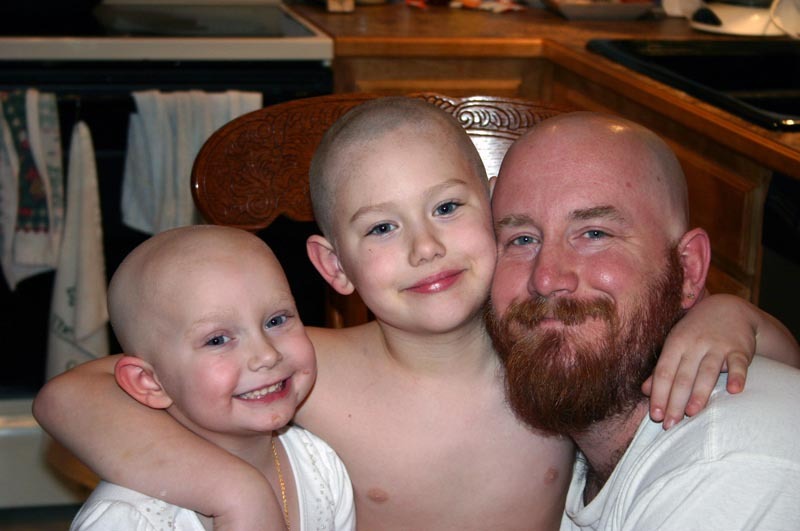 If you notice Eric's beautiful bald head, he shaved it to match his daughter's, and Aspen's older brother, Alex, shaved his too, so now Aspen is not the only one. 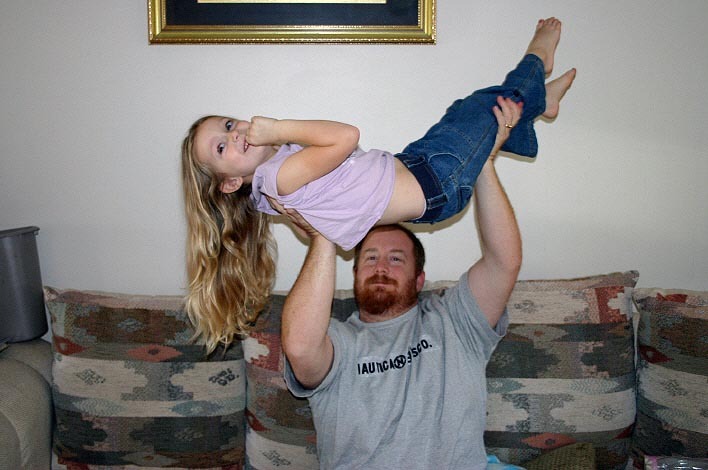 Check out the wonderful "matching" photo of Aspen, Alex, and Dad. Making that call to Eric was no easy task. A couple of days ago, we contacted Kelly, who we thought was the postmaster where he worked and she agreed to help us surprise him. But when I called her this morning to make sure Eric was close by, she said she's not the postmaster, and that someone named Cheryl was, and she knew all about the surprise. So I called Cheryl (who was an hour away from Kelly in Blue Springs) and Cheryl told me she had to leave, but a supervisor named Leanne knew all about it, and I should call her. When I called Leanne, someone named Cheryl answered but it was another Cheryl. It turns out they have four. By now Damon and I were panicking. The newspaper reporter was supposed to contact Kelly but she was no longer the contact, so I called his cell phone, got voice mail, and left a message for him to call Leanne. In the end, the reporter went to the right place, Eric was there, and I made the call. Just when we think we've anticipated any kinks in our plan, Damon and I hit a new one. It was pretty funny, and of course it all ended well. 5/21: Jenny wrote... "Eric, I’m happy to help you provide all these wonderful things for the children. Please give Aspen a hug from me." 5/21: Damon wrote... "Hi, Eric. 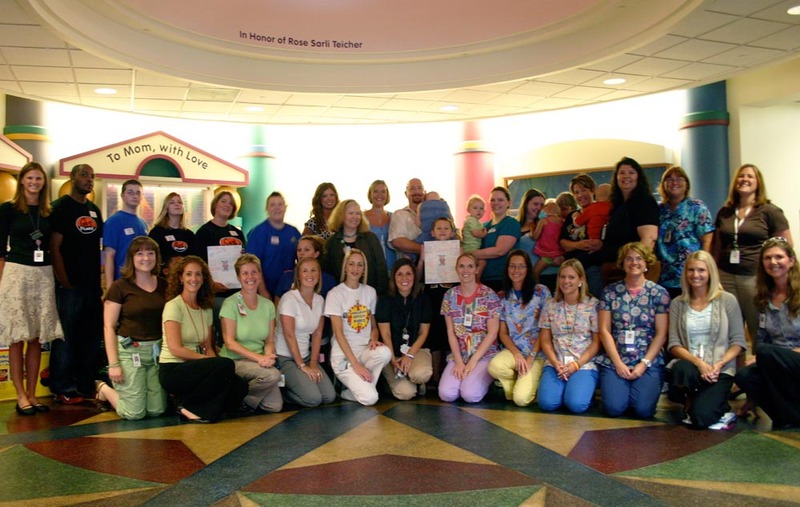 It's such an awesome thing you're doing for the kids at Mercy Hospital. Congratulations!" 5/23: Michelle wrote... "Thank you Eric! Although we are not near CMH - we know all too well what it's like to have a child hospitalized. What you've done for these children is so greatly appreciated! You will put smiles on the faces of so many that feel they may have nothing left to smile for. In desperate times... the articles you've provided to this hospital will keep their hopes up for a brighter tomorrow. Every little bit helps and sometimes... it's the littlest things that mean the greatest deal to these little fighters! 5/23: Terri wrote... "Congratulations to you Eric! Your generosity will certainly go a long way to brighten the days of Aspen and the other children at CMH! Blessings to you and your family." 5/23: Jackie wrote... "hi eric. I just wanted to congratulate on being one of jenny's winners. I know the hospital will appreciate everything you will do for them. I know a little bit about being one of jenny's winners too. My name is Jackie and I am winner #4. I had the privledge to donate to Childrens Hospital in Los Angeles. I just went through this process and if you have any questions or if you need any contact numbers I would be happy to share all of my information with you. Best wishes to you and your family"
Your daughter, Aspen, will be added to my prayer list of other children on the Caring Bridge site. 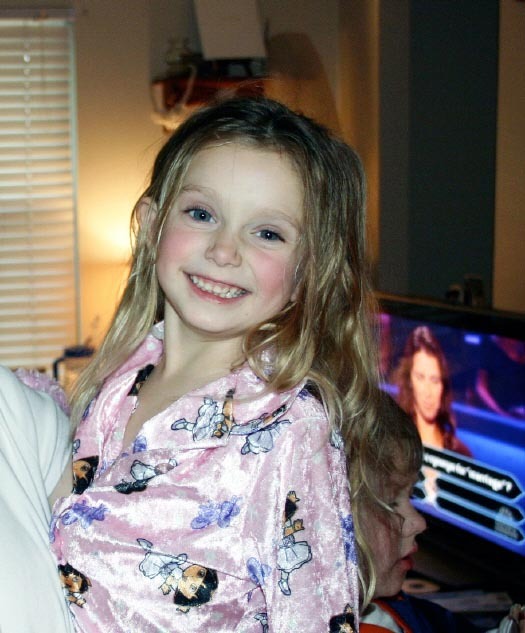 Would it be possible to have your daughter's Caring Bridge name so I might continue to follow her progress? Thank you. God Bless you and your beautiful family." 5/27: Margie & Kelly wrote... "Eric - Just wanted you to know we made it to Jenny's site and saw the story! You rock! You have such a big, caring heart and a kind soul - we feel extremely blessed to call you our friend and want to congratulate you again on your achievement and for being such a hero to us all! Please give Aspen a big hug and a kiss from us!" 6/21: Best Buy Staff wrote... "Thank you, Eric, for making our community a better place for our kids. From Independence, Missouri Best Buy Store 36."